IBM® zEnterprise® Data Compression (zEDC) capability and the Peripheral Component Interconnect Express (PCIe or PCI Express) hardware adapter called zEDC Express were announced in July 2013 as enhancements to the IBM z/OS® V2.1 operating system (OS) and the IBM zEnterprise EC12 (zEC12) and the IBM zEnterprise BC12 (zBC12). zEDC is optimized for use with large sequential files, and uses an industry-standard compression library. zEDC can help to improve disk usage and optimize cross-platform exchange of data with minimal effect on processor usage. The first candidate for such compression was the System Management Facility (SMF), and support for basic sequential access method (BSAM) and queued sequential access method (QSAM) followed in first quarter 2014. IBM software development kit (SDK) 7 for z/OS Java, IBM Encryption Facility for z/OS, IBM Sterling Connect:Direct® for z/OS and an IBM z/VM® guest can also use zEDC Express. zEDC can also be used for Data Facility Storage Management Subsystem data set services (DFSMSdss) dumps and restores, and for DFSMS hierarchical storage manager (DFSMShsm) when using DFSMSdss for data moves. 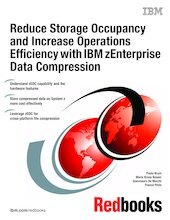 This IBM Redbooks® publication describes how to set up the zEDC functionality to obtain the benefits of portability, reduced storage space, and reduced processor use for large operational sets of data with the most current IBM System z® environment.